Intranets are infamous for their terrible user experience. There are hundreds of outdated pages that users have to navigate through to find the few pages that are relevant to them. It’s the primary reason intranets fail. At Jostle, we’ve overcome this problem. We’ve built an intranet that allows you to easily target information to the right people. Every time someone checks the intranet, the content they need is right in front of them (and not obscured by a clutter of information that isn’t relevant). 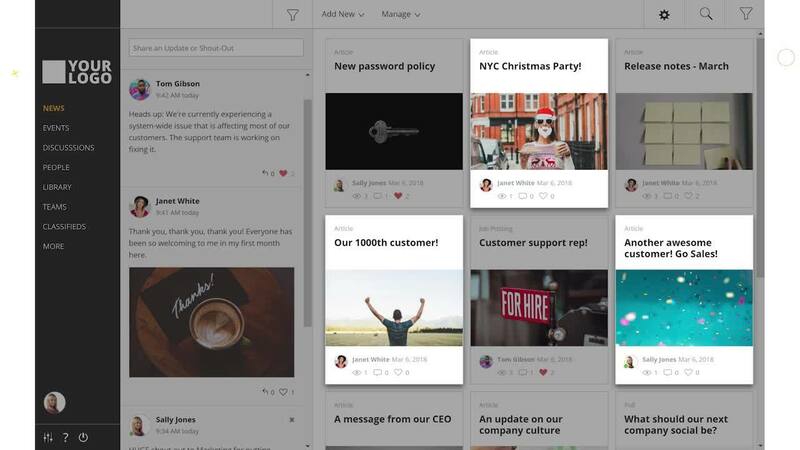 How do we make an intranet that’s relevant to every user? During onboarding, you’ll add data about your employees to your Jostle® intranet—their location, their team leader, their division, and so on. Once you’ve uploaded this information (which is really simple), you can easily target information to exactly the right people. Our powerful List Selector allows you to quickly dial up specific combinations of people, teams, and locations to create an exact target audience. For example, all of your sales people in New York. You can then reach that audience with relevant company news, group messages, documents, and event invites. When your organization changes (for example, a new person joins the team, or someone switches locations), their content will automatically be updated. They’ll immediately see everything they need to. In DISCUSSIONS, our instant messaging feature, you can start a conversation with a precise group of people. For example, the sales team in New York. When a new person joins that team, they’ll automatically be included in this conversation and see its history. Jostle intranets comprise a small number of purposeful views. NEWS is the go-to place for, all your company news. People don’t need to check dozens of pages—HR, Finance, Sales—to get updates. The reason this works (and doesn’t get noisy) is because of targeting. Your New York salespeople won’t see the article on the Seattle Christmas party, but they’ll see the article on the NY one. Let’s say you only want your senior leaders to see files on a confidential initiative. Simple. You’ll use the List Selector to set up a section in LIBRARY that only they can see. Targeting sections of LIBRARY in this way makes content ownership clear, ensures confidentiality, and avoids user confusion. No-one has to wade through irrelevant forms or documents to find what they need. Being able to target content in this flexible and powerful way means the Jostle platform doesn’t need thousands of illogically organized intranet pages. In fact, there are just eight purposeful views (pages) to navigate. All of the complexity is in the back end, so we can keep the user experience simple. That’s why our users keep coming back, time and again. And it’s how we achieve engagement levels that are 5X higher than industry norms. This is why Jostle works. But it’s a fraction of what we can do. Find out more in this 2-minute video.